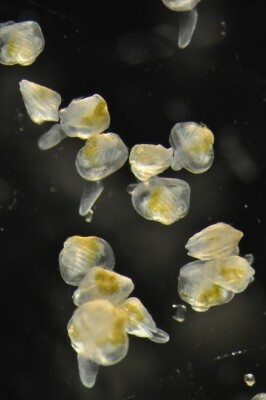 Recent advancements in assessments using early life stages of test organisms (like the larval mussels shown) provide robust alternatives to full life-cycle chronic ecotoxicity tests. Photo Credit: Douglas Hardesty, USGS. During the past two decades, great strides have been made toward the development and use of ecotoxicity testing methods that reduce animal use or replace animals altogether with in vitro tests or in silico models. replacement of animals with other test systems whenever possible. Although this concept initially focused on laboratory mammals, in the last two decades there has been significant progress in applying the 3Rs to test procedures and techniques in fish, amphibians, and birds. Today, the need for and use of alternative methods in place of classic vertebrate toxicity tests is at the forefront of both science and animal welfare. The first consideration when initiating a formalized ecotoxicity test or research study is to ensure that vertebrate organism use is minimized whenever possible. demonstrate significant progress towards alternative approaches for ecotoxicity assessments. Before registrants and chemical regulators can have confidence in any alternative approach, evidence must be generated to support the reliability and adequacy of the method, as well as the limits and constraints of their applicability. The historic 3Rs (reduce, refine, replace) have been expanded to the "6Rs", with the addition of data on ecotoxicity test reproducibility, ecological relevance, and regulatory acceptance. This review was prepared by members of the Society of Environmental Toxicology and Chemistry (SETAC) Global Animal Alternatives Interest Group and funded in part by the U.S. Geological Survey (USGS) Contaminant Biology Program. Lillicrap, A., Belanger, S., Burden, N., Pasquier, D.D., Embry, M.R., Halder, M., Lampi, M.A., Lee, L., Norberg-King, T., Rattner, B.A., Schirmer, K., and Thomas, P., 2016, Alternative approaches to vertebrate ecotoxicity tests in the 21st Century—A review of developments over the last 2 decades and current status: Environmental Toxicology and Chemistry, v. 35, no. 11, p. 2637-2646, doi:10.1002/etc.3603.